For many years I've been learning to play the Irish whistle at various sessions around Santa Cruz including some that are open to the public such as Britannia Arms in Aptos. 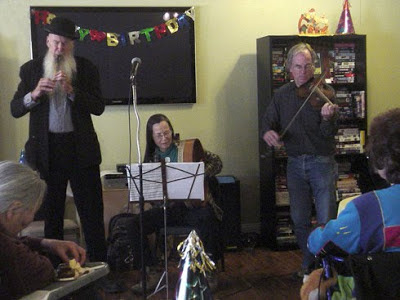 Happening upon one of our public sessions, Lynnette, entertainment director of Driftwood, a retirement community near the beach in Live Oak, asked if we could play for a birthday party. A few of us agreed, called our group Blarney and did the Irish bit for the party. Last week, Lynnette invited us back. In this incarnation, Blarney consists of Nick Herbert on Irish whistle, August O'Connor on bodhran (frame drum) and Peter Koeneman on fiddle. A good time was had by all. The word "Blarney" means eloquent (often nonsensical) speech -- the "gift of gab" -- and is associated with the Lord of Blarney Castle in county Cork who exasperated Queen Elizabeth I by his ability to talk endlessly without ever acceding to her demands. 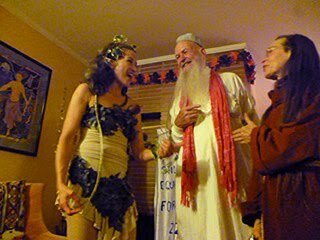 On the week of the Blarney concert I was invited to one of the most prestigious venues in Santa Cruz -- Kate Bowland's legendary Halloween party. Kate Bowland is one of the most powerful "witches" in Santa Cruz, a world-famous midwife who has delivered more than 2000 babies in her long career, a mistress of ceremonies in the many female dance and drumming circles around town. Kate is a woman with a lot of mojo. The tradition at Kate's masquerades is to interact "in character" with the other party-goers for the first hour and later have the option to be yourself or continue in character. At a previous Bowland Halloween that I was privileged to attend, two woman came, one dressed as Marilyn Monroe and the other as Jackie Kennedy. After seriously ignoring one another for most of the hour they suddenly came together in a public cat fight that was the hit of the evening. Following the enthusiastic reception of the Blarney event, August and I were so full of ourselves that we decided that I should go to Kate's party as "God" and she would come as "God's Bodyguard" -- a rehabilitated fallen angel armed with a ray gun for smiting those who might dare to piss off the Supreme Being who made all things and keeps them in existence. So we drive to the party, turning heads at Trader Joe's, as God and his sidekick shopped for supplies. As expected, the people at Kate's party were superb. Kate herself was dressed as a red, white and blue suffragette complete with political banners loudly arguing for woman's equality and right to vote. As I was going into the kitchen for a beer (God likes Guinness) I bumped into a scantily-dressed woman with laurel in her hair, an apple at her bosom and a snake around her neck. On her back was a small sign: "I left him in the flying saucer." I introduced myself: "Eve, I presume. I'm that guy that put you in the Garden." We spent a lot of time talking with Eve, whose real story was as fascinating as her legend. God and his sidekick found Earth's first sinner, Earth's first scientist, to be a lot of fun. But for me the best riff occurred at the beginning. I had just gotten inside the door when two more guests arrived, dressed as a pair of magnificent hippies, big wigs, fake moustache, splendid attire. I asked: "Who are you two?" "I'm Sonny Bono. And this is Cher." The disguise was perfect--Sonny and Cher really looked the part. "And who are you?" Sonny asked. "Why I'm God," (pause) "Good acid, eh?" By the year 2202, interstellar travel had been achieved and thousands of planets were colonized, due to the invention of a simple FTL teleportation device--called the "Nick Machine", a technological spinoff from the research boom in quantum tantra. The major barrier in 2202 to travel between the stars was no longer technical but psychological as various human-based cultures created their own "no-fly lists" at every teleport node in order to prevent the spread of what each of them considered "evil" into the galaxy. This network of no-fly zones divided the galaxy into virtual ideological gulags (VIGs) inside which certain citizens were confined against their wills, isolated forever from the advantages of interplanetary travel. And the surest way to find yourself on a no-fly list was to criticize this system or even to mention the existence of VIGs. 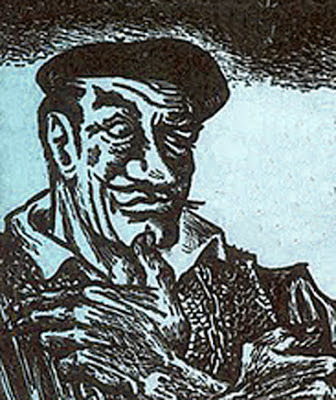 Ferdinand Feghoot had recently concluded a mutually beneficial love affair with one of the top quantum tantrikas on planet Literati and, after a lunar cycle of intimate farewells with the tantrika and her friends, he arrived at the Literati Airport to "fly" (instantaneously) to the Red Zone in Aldebaran a hundred light years away. To his dismay he discovered that his name was flagged on the Literati "no-fly" list as a notorious interplanetary punster. The Literatis were firm believers in the sacredness of language and regarded all puns as sins against the purity of the spoken word. "Feghoot, You shall not pass," said the gate-keeper at the Nick Machine. "You are well known, FF, as a multiple offender against the sanctity of language." See here, here and here. And he stamped Feghoot's boarding pass with a big red X. "Wait, wait, there's been some mistake," said our hero. "Praise the Word. I am not that heretical lout. I am Ferdinand Feghoot QED, Professor of Quantum Geometry, on my way to an important science convention on Aldebaran III where I will be giving the keynote speech. If I am delayed even 10 minutes your whole planet will be disgraced by this incident. And you, sir, will probably be sent to the language mines." "I may have been born in Sarfattistan, Feghoot, but I'm no gullible dupe," the crossing guard replied. "If you're such an important professor, show me something impressive to prove it." "Praise the Word. I'm glad you asked, kind sir. I am just on my way to the Red Zone to present my latest result in Quantum Geometry which I would be happy to share with you. What most people don't know about reality is that ordinary plane geometry is subject to a fundamental quantum uncertainty--measured in "Plank units", named after an old American word for a flat piece of lumber. And I, Ferdinand Feghoot QED, Praise the Word, have devised the simplest proof in the entire galaxy of Fundamental Geometric Uncertainty. Feghoot's Proof is so simple I can even demonstrate it to you, sir". "America?," the guard asked. "Isn't that the empire that was ruthlessly plundered by the ---?" "Yes, yes, but that's ancient history. Do you or do you not want to see this proof? No one else has ever seen it. It's brand new. You'll be the first. I'll show it to you only if you print me up a fresh boarding pass." "OK, person who's calling himself Doctor Feghoot. But I'm keeping this new pass in my hand till I see that proof." "Fair enough," said Feghoot. "Now hand me that old pass." Upon receiving the old pass, Feghoot pulled a pair of scissors from his backpack and cut the pass into four pieces which he arranged into a right triangle. The triangle was 5 Glips in height and 13 Glips long. "What is the area of this triangle?" asked Feghoot. "Every child knows that, Feghoot. I'm not impressed. Area of any triangle is 1/2 Base times Height. Base is 13 Glips; Height is 5 Glips. 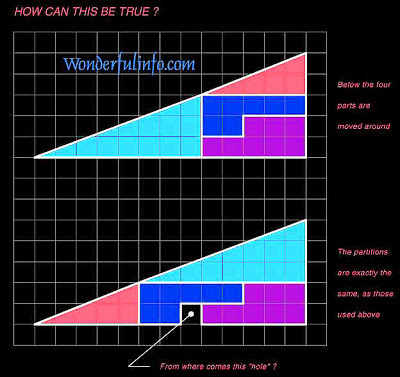 Area is 32 and a 1/2 square Glips." "That's correct, sir. Now watch closely," said Feghoot as he re-arranged the four pieces of the cut-up boarding pass. "What is the area of this new triangle?" "Why, the base and the height of this new triangle are the same, so the area is the same also. The answer is 32 and a 1/2 square Glips." "But observe, sir. This new triangle has a hole in it exactly one square Glip in size. Where did that hole come from? From Quantum Geometry, I say. That hole represents precisely the one quantum of uncertainty that dwells invisibly in all triangles. Dwells invisibly until now. Dwells invisibly until revealed by Feghoot's Proof. Now hand me my boarding pass. I'm off to show this to my colleagues"
Feghoot steps into the Nick Machine, inserts his new boarding pass, and is instantly present in a distant Nick Machine on Aldebaran III. Meanwhile the crossing guard (and you and I) are left with the paradox of the hole in the triangle. One reason why medieval philosophers such as Thomas Aquinas never developed a sophisticated description of the material world might have been that the priorities of thinkers in the Middle Ages were different than our own. The aim of Thomas Aquinas and his colleagues was to discover the nature of God. Hence they treated the world not as a physical object with its own intrinsic laws but as the personal creation of a divine being. The facts of this world, unimportant in themselves, could tell us about the nature of God in much the same way as a painting or sculpture might inform us about the nature of the artist that created it. A bit of this same theological spirit surfaces in Einstein's famous statement: "I want to know the mind of God; all else is details." Anyone seeking to know the nature of God by studying the physical universe will certainly be fascinated by quantum theory, our deepest and most successful theory of matter. Quantum theory is deeply paradoxical and seems to obey a distinctly non-human logic. One of the most peculiar feature of this theory is the way it seems to effortlessly embody seemingly contradictory aspects in the same phenomena. One of the most elegant examples of quantum theory's union of opposites is the recently discovered fact of quantum teleportation which unites in one system both a faster-than-light transmission of information plus a clear prohibition against humans using this undeniable FTL connection for sending FTL messages. Quantum theory also embodies the unusual feature that the world we see depends on the questions that we pose. Hence the more sophisticated we become in asking questions of Nature, the more sophisticated will be Her replies. Quantum teleportation is a special feature of quantum entanglement in which two photons emitted from a special source give up their individual identities and enter a collective state. The collective two-photon state has definite properties but the individual photons do not, until they are actually observed. For example, in the entangled state W(A,B,+), photons A and B will always be observed to have the same polarization; in the state X(A,B, -), photons A and B are always observed to have opposite polarization. These two entangled states W and X are part of a complete set of entangled two-photon states W, X, Y and Z, called the "Bell states" (after Irish physicist John Stewart Bell). Any two-photon state, whether entangled or not, can be expressed as a sum of the 4 Bell states. This fact is essential to the process of teleportation. Alice acquires a photon "?" with an unknown polarization which she wants to teleport to Bob. 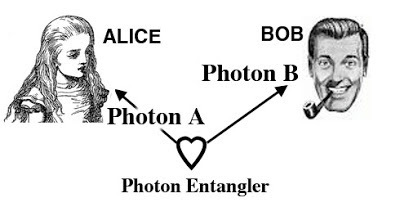 This photon IS NOT ENTANGLED with Alice's photon A but Alice employs a clever trick--only possible in quantum theory. 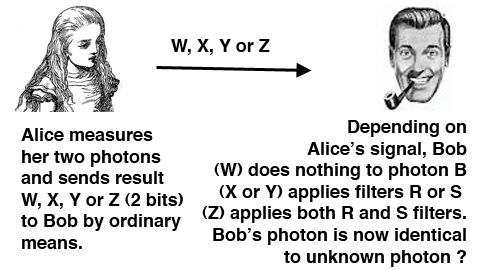 Alice expresses the quantum state of photon "?" and photon A as the sum of the four entangled Bell states W, X, Y and Z. She does this sum in such a way that all the entanglements cancel and the total quantum state of "?" and "A" is unentangled. Alice's move reminds me of a string trick I learned as a kid in which you wrap a loop of string around your fingers in a complicated way so that it looks as though the fingers are entangled in the string. But upon pulling the string the fingers are freed--every loop of string was cancelled by an anti-loop. It's the same with the two photons--every seeming entanglement is cancelled somewhere by an anti-entanglement. Given this setup, here's how quantum teleportation works. Alice asks the question: which Bell state is my system in? This question can have one of four answers W, X, Y or Z. If the answer is W, then Bob's photon has the polarization "?". Teleportation is accomplished. 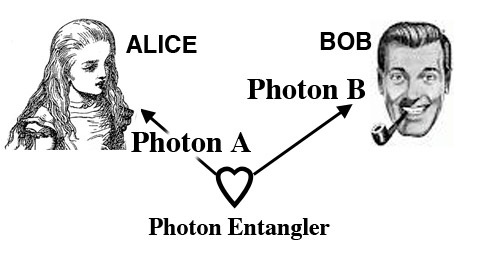 If the answer is X, Y or Z, the polarization of Bob's photon differs from "?" only by a rotation R, a phase shift S or a combination of both. 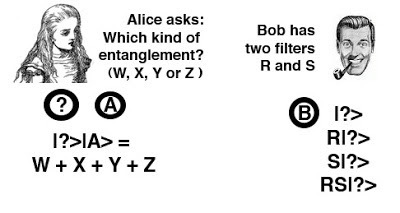 So for 100% efficient teleportation all Bob has to know is what Alice's result was--W, X, Y or Z--a piece of knowledge that consists of only 2 bits of information. Without these two bits all that Bob sees is a random hash. With these two bits an infinite amount of information can be teleported. (The polarization of a photon can point anywhere on a sphere. The teleported information corresponds then to sending an unknown latitude and longitude on the surface of the Earth to a distant location faster than light. However this information cannot be decoded without the 2-bit key which must be sent by Alice to Bob at light speed or slower.) Thus a large quantity of quantum information can be teleported faster-than-light but this information is unrecognizable in the absence of a 2-bit code which can only be transferred over conventional channels. Quantum teleportation was discovered by a six-man team in 1993 and experimentally demonstrated a few years later. Teleportation is a particularly elegant example of quantum theory's subtle union of opposites--in this case the coexistence of a large FTL data transmission with the impossibility of sending signals faster-than-light. Let's face it. We are only at the beginning of experiencing and appreciating the inhumanly beautiful mysteries of the quantum world. Hard particle and soft wave: both? Utterly random and perfectly predictable: both? Small right-here and spread-out everywhere: both? Deep connected yet lonely separate?